Oliver Queen's "Arrow" costume doesn't change a whole lot throughout the first three seasons. When we see flashbacks of him on Lian Yu (the island), he wears the beginnings of his costume, but it's really just the hood and bow. You can always buy a full costume like this, but I feel like those aren't as high of quality as custom, pieced-together costumes. Of course the quality of the costume usually depends on what it's being used for - parties, cosplay conventions, etc. ​The jacket and hood that Oliver wears as The Arrow is a custom piece. I originally assumed it would've been a name brand jacket that the costume department just put a hood on. Apparently that's not the case, but I did of course find some pretty good replicas. ​If you're really into doing your own custom costume, then I'd suggest checking out Ebay and looking for a green leather jacket. A good suggestion I read somewhere was to rub shoe polish on the jacket if the shade of green is too light. ​If you'd rather buy something that's already made, my favorite replica is this replica Arrow jacket. The hood is detachable, which (along with it looking really good) is why I like it so much. It's a very dark green (as it should be), so I feel like it can still look good as a normal jacket. ​It may not look like it, but Oliver does wear a shirt under his Arrow jacket. The exact brand is Under Armour, but the exact model of the shirt isn't carried anymore. But this is really more of a comfort thing when wearing the jacket, as I imagine it would get pretty sweaty and uncomfortable without it. ​I feel like I searched pretty thoroughly, but I wasn't able to find what kind of leather pants Oliver wears with his Arrow costume. Usually this just means that the clothing was custom made by the show's costume department. ​It's relatively common knowledge now, but Oliver Queen's Arrow boots are actually Nike Free Run 2 shoes, modified by attaching the tops of combat boots to the top of the Nikes. This actually makes a lot of practical sense, since The Arrow is generally running around a lot and running across rooftops. ​If you want to buy the Nikes, you can check them out here. You'll want the all-black ones (the screen accurate ones are black with anthracite soles, but those aren't available anymore). A quick update on this - the Nike Free Run 2.0 shoes (the screen accurate ones) don't seem to be available anymore. I searched around, and I think these Nike Roshe 2.0 shoes look pretty good. ​If you don't plan on going for the screen accurate shoes (since you'd have to modify them yourself), you can easily get away with getting some lace-up combat boots. This would be much easier, and in my opinion, wouldn't really detract from the costume overall. These combat boots by Polar Fox would work great, and they're relatively cheap, too. I also like these tactical boots by Maelstrom, I think they have more of an athletic look over normal combat boots. ​If you're dead set on owning a screen accurate bow, then my suggestion is to go for the season 1 bow. You'd have to customize it a bit yourself to get it fully screen accurate, but it's a lot cheaper than season 2's screen accurate bow. ​The base of the bow Oliver uses throughout season 1 is a Ragim Jr. 48", 24lb draw bow. It's not extremely cheap, but for something screen accurate, that's not too bad. ​That's basically all there is to it. You could also do some sanding here and there if you want to add some extra wear and tear to the bow. 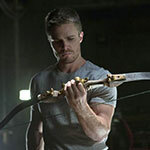 ​In season 2, Oliver is presented with a new bow, since he broke his first one at the end of the first season. ​If you're not too concerned with screen accuracy, and you're worried about safety or price, then you can always just get a bow meant for costumes. Costume/toy bows obviously are going to be a lot cheaper, and you won't be able to hurt anyone with them. This wooden bow set would work pretty well, it still looks relatively realistic, but is still obviously not real. ​You could also go with the real toy deal and get this suction cup bow and arrow set. It would definitely make for more fun at parties or an event. ​The quiver Oliver uses on the show is another custom made piece, it's hard plastic with leather on the outside. Whether you plan to customize your quiver or not, I'd at least try to get something that looks close to start with. This quiver by Neet Archery would work great, it's an older fashioned style made of leather, and would make a great base if you wanted to modify it further. ​Lastly, this OMP Mountain Man suede quiver would look great too, it's also a dark leather. To finish off your Arrow costume, you'll need a few accessories. Most of them are pretty easy to get, including the same exact gloves Stephen Amell wears as The Arrow. 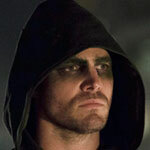 ​While running around as The Arrow, Oliver Queen (of course) uses gloves. Not only would they be important for keeping his fingerprints off of things, but constantly drawing his bow and punching people in the face would wear his bare hands down pretty quickly. ​Depending on which season/look of The Arrow costume you're going for will more or less determine which to get. Or maybe you'd just rather not paint your face green. Either way, if you're going for the earlier look (green face paint around your eyes), then I'd suggest this dark green face paint by Paradise. ​It's got great reviews, which is something to really watch out for when it comes to painting your face. Next, if you're going for the mask look, you've got plenty of options. My first suggestion would be this latex Arrow mask. ​It's a bit on the expensive side, so I'd only get it if you're going for the most authentic/realistic look. Latex shouldn't slide around on your face, and also conform to it pretty well. My other mask suggestion is this fake leather mask. ​If you're not as worried about how good the mask looks (and if you've got your hood up, it really won't matter too much anyway), or maybe you just want a cheaper option, this mask is the way to go. ​I know at the beginning of this guide I said I didn't like mass-produced costumes, but for some people, that's all they really want/need. And unless you're able to get most of the costume pieces used, buying the mass-produced one would be cheaper. ​If you're looking for a fully made costume, then I'd suggest this one by CosplaySky. Like I said before, it may not be perfect (no mass-produced costumes are), but CosplaySky is relatively well known and have a good reputation. ​This is another good reason to buy a pre-made costume. If you want to do as little customization as possible yourself, and don't mind spending the extra money, you can buy the costume, and replace the parts you don't like with the pieces I mentioned earlier. Do you know what kind of crate Oliver uses to keep his bow in during season 1? There are some good pics showing a lot of the detail. If you’re not familiar with The RPF and you’re into TV show and/or movie props, it’s a great forum for that. Lots of people really into the tiny details on things like this.